The purpose of the Architectural Committee is to maintain community standards, approved by the Board, for maintaining and repairing the homes and infrastructure throughout Oceana. 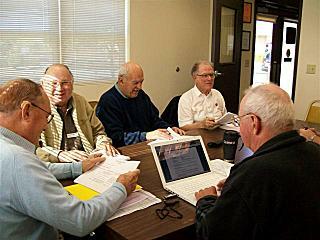 Seven resident members meet monthly to assist other residents in processing the paperwork required for making additions or changes to the exteriors of Oceana homes. The committee is an information source for dealing with City Building regulations and assisting residents in acquiring building permits. We address problems assigned by the Board, such as inspections, special situations and emergencies. Requirements: Common sense, a love of our community, and about three hours of available time each month. We will train interested residents and provide educational reference material. The Architectural Committee normally meets on the 2nd Tuesday of each month at 9:30AM in the Clubhouse Card Room. Agenda items for the next meeting must be received by the 1st calendar day of the month.